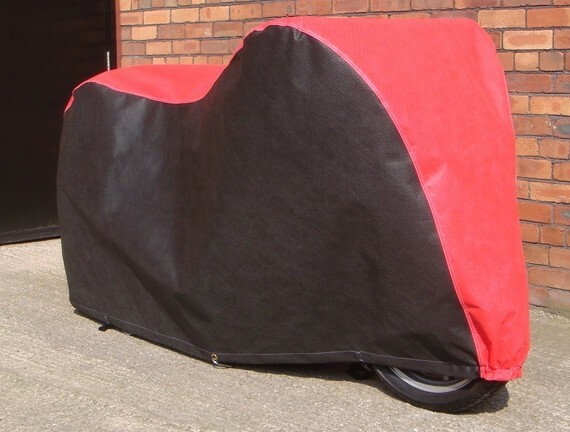 Our TRITECH Motorbike covers are designed to protect bikes from the harmful effects of direct sunlight, dirt, abrasion and damp weather. The triple layer protection allows the cover to breathe whilst remaining 100% waterproof. All covers are semi-tailored and come in a wide range of styles and two-tone colours. The covers have snap buckles, straps and brass eyelets to allow a padlock to secure the cover. Colour Choices Available to You. We require the following measurements if you have a high screen, top box or paniers fitted. D : Measurement from ground to top of front screen. E : Widest Measurement across Wing Mirrors or Hand Guards or Bars. Simply Select your Aprillia model below as well as any options you may have and we will supply the correct fitting cover, Simple and Easy. If no Top Box is Fitted the B Measurement should be the highest point ay the rear of the bike. WE DON'T REQUIRE MEASUREMENTS IF BIKE HAS NO PANIERS AND / OR TOP BOX. Gas Gas Motorcycles STORMFORCE 4 Layer Outdoor Waterproof Cover.